To quote myself, “it was a Tuesday. All tragedies begin on a Tuesday. I was born on a Tuesday.” The Andre Huguenet Theatre is abuzz for the first time in ages. ‘Abuzz’ is a nice way to say people drifting aimlessly in the dim humid foyer of the ageing theatre. Two monochrome copies of the macabre headshot of the producer Mzwakhe Khachela greet the patrons. On each of them two candles. Not very cryptic – we are at a funeral. It is no surprise then, that as we walk into the theatre, the three women on stage are dressed, as you’d expect, in mourning clothes. We can see the umhlolokazi on the mattress, as per cultural dictates. The three women are in discussion over the tardiness of those tasked with bringing the body of the deceased home. The patriarch comes in apologetically – there’s an issue, but it will be sorted out soon. Just don’t ask what, he chides ‘the women’. Suspense! Is the dead man not so dead? Has his body perhaps been hijacked by sorcerers intent on turning him into a zombie? Or maybe a murder inquest delays progress? The answer – if we can call it that – is too bland to comprehend. Finally the body arrives, the patriarch and his wife in tow together with an unknown child and woman dressed also dressed as umhlolokazi – albeit more stylishly. This woman insists on sitting on the mattress and is allowed to sans an explanation. 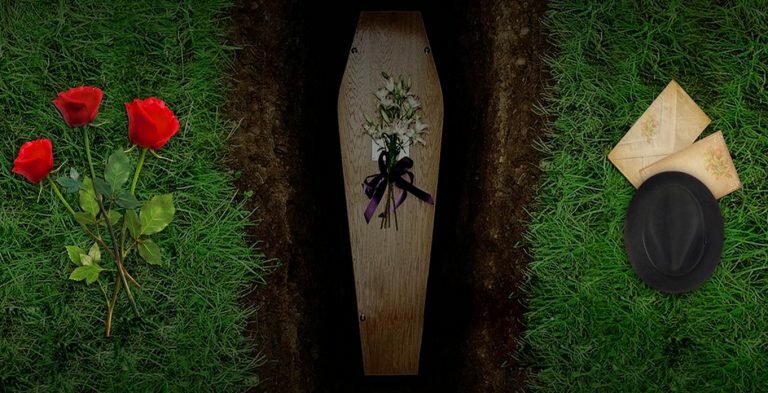 The woman reveals way into the proceedings that she is also a wife of the deceased, the mother of his only son, and has a letter to ‘prove’ that the deceased has appointed her chief mourner and sole beneficiary. Everyone is shocked. This then brings into question why such an abomination was permitted in the first place if no one knew of her status, because the mattress is a privilege reserved for a grieving widow. At this point one excuses this plot hole, maybe it will be clarified later. But little does one know that this is no fluke, the whole affair is bottomless pit of plot holes. The big reveal in the end? You guessed it – the unknown wife is a fraud. The story is a well hashed one. Think Muvhango – rural wife vs urban wife. Think Kwakhala Nyonini – umfazi wenkomo vs umfazi wephepha. But here it is written with no ounce of creativity, intrigue, or flair. The whole thing sounded almost as if the writer suffered the misfortune of being in the inner circle of funeral arrangements, recorded the whole thing on their phone, and employed the services of a half-talented student to transcript the recording, and voila! The script was done. The result being that we had to suffer over an hour of trite, repetitive and long-winded bickering between family members who were implausibly gullible and cheaply triggered into indignation. The beautifully harrowing hymn singing in the beginning of the play threatened to save it had it not been short lived. The singing was never used as any sort of storytelling device, but like the rest of the script it was just a snapshot of what happens in a grieving home. In fact, at best Umhlolokazi could be a half-decent attempt at a reenactment in a documentary or reality TV show about funerals, but as a work of art it doesn’t make the cut. The conflict in Lesedi is another well-known one; Christianity versus Sesotho. The child, Lesedi, was born with a calling her parents disavow. As is often the case in these stories, she suffers: failed school five times, can’t get or hold on to a job, and of course inexplicable dreams/visions torment her. All of this has been seen and heard many times before. On the Andre Huguenet stage in particular, this similar thread was explored spectacularly in Paleho. This time around, to our great misfortune, not so much. Although, it started with a bit of a promise: Lesedi wakes up on the dining table from her recurrent sleepwalking, covered in a black cloth. She wrestles free of this darkness, as it were. Her mother steps in; the girl has a sanctuary to run to. But first, she implores her mother, get rid of the darn cloth. What a great device, the cloth. What a great metaphor! “Metaphors are dangerous.” Milan Kundera claims, “love begins with a metaphor.” But the infatuation with Lesedi is short-lived. The cloth is never to be seen again. No other metaphors follow. Instead the play painstakingly pores over the minute details of the humdrum of breakfast, and preparations for work, and supper, and table manners, and all manner and sort of dreary daily activities that bring us not an inch closer to understanding the characters or the story. The second act, as Lesedi finally pursues her calling, also starts off promising. The music coming off the speakers is a thing of beauty, as is the dancing by the recruits and their savant on stage. But soon the act devolves into a meaningless frantic stomping to and fro, repetitive burning of mpepho and lighting of candles, non-poetic clan namedropping, bickering, and poor attempts at dramatic irony. None of which represented neither cogent nor coherent storytelling, rather seemingly done to ‘fill up’ the ninety minutes. The artists involved in the productions, their culpability notwithstanding, are as much victims of a systematic failure as are the swindled audiences. As both plays are touted as ‘capacity building’ projects, it then follows that they are more than artistic failures but a result of institutional neglect. Pacofs’ key mandate is to develop the performing arts in the province, and these two plays expose a well-known secret: the institution is in a dire state of disarray. There is no way that a well-functioning Centre would present such “first drafts” to a paying audience. A lot of the problems with both plays could have been red flagged and fixed at a script workshop with independent practitioners, as all the major issues are in the writing. However it seemed that the institution was just in a rush to put a dent on its Quarter 4 target of “seven developmental productions showcased”, a mere tick box exercise that cares no curse for neither the art, artists nor audiences. Pacofs failed dismally to build capacities of these young artists. Mpho Matsitle is a self-declared chief art patron of Mangaung, and a professional ‘bitterist’.